Ronnie stands in his one-dog soup line. Ronnie is a feisty 7-month-old cross between a Labrador retriever and a rottweiler, so he’s definitely going to be a big fellow. He’s also a pup with some special care needs. Ronnie the dog has a medical condition called megaoesophagus which causes him difficulty eating; he cannot swallow food and will regurgitate it if he eats standing like a normal dog. Because of his megaoesophagus, Ronnie the dog has to eat standing up or he will starve. 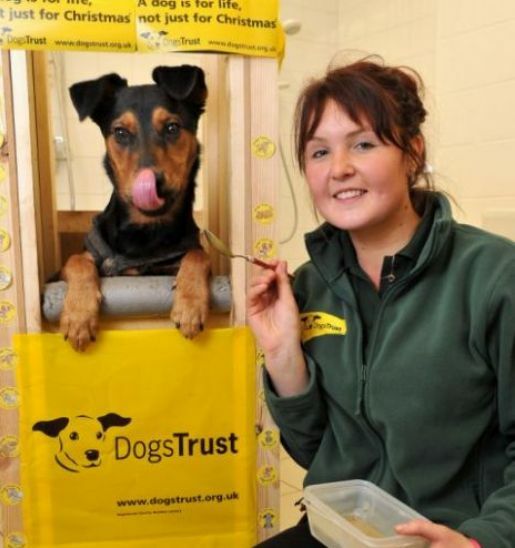 The custom-made feeding station on which Ronnie leans while taking his meals is made of wood; Ronnie is fed with a spoon and his meals are made into jelly form so as to make them easier for the pup to swallow. Ronnie’s meals take in excess of 20 minutes and he will need to use the feeding station to feed for the rest of his life.